1933-2003 - Seventy Super Years! Superman came to Jerry Siegel and Joe Shuster in bits and pieces, beginning seventy years ago. Jerry Siegel and Joe Shuster! 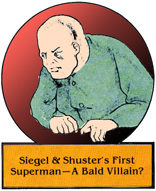 The first "Superman" they conceived of had extra-ordinary powers, but was a villain. The Reign of the Superman, written by Jerry Siegel and illustrated by Joe Shuster, was published in January of 1933, in the third issue of Siegel's fan magazine SCIENCE FICTION, The Advance Guard of Future Civilization. This issue also contained a letter to the editor by a young Julius Schwartz, who decades later would become the editor of Superman Comics. The second Superman was a heroic crusader for justice. Although now on the side of good, he was still a man from planet Earth. This character was very similar to pulp heroes like Doc Savage and was the the fore-runner to another Siegel and Shuster creation, Slam Bradley. Siegel and Shuster wrote and drew an entire Superman comic book in 1933, but after failing to garner the interest of the intended publisher, a distraught Jerry Siegel destroyed almost all of the pages in a blazing fire. The only piece of artwork that survived is the cover, rescued from the flames by artist Joe Shuster. It wasn't until the third Superman that the final pieces of the puzzle were added. This Superman inherited the personality and heroic nature of his predecesor. He is the Superman we know today, complete with costume. He has powers because he came from another planet. He has the dual identity of Clark Kent and Superman. He and Lois Lane are rival newspaper reporters. Clark Kent, Lois Lane, and Superman are the three points of an unrequited love triangle. All these details occurred to Jerry Siegel in one summer night.